Summary Storage-centric Atheros-based "N900" abgn router with user-installable 3.5" internal drive, dual USB 3.0 ports and SD card slot. Part 1 of this review provided a feature and function overview, look at the internal details and analysis of the Centria's routing and storage performance. We conclude our coverage of NETGEAR's latest top-of-line N router with a look at its wireless performance and a bit of stress testing. First an update on noise. I've noticed that the router's blower has gotten more noticeable over the week that the Centria has been powered on. I can now clearly hear it in my quiet home office, over the sound of the other quiet fans in my home office. (Note that the Centria is sitting on a desk and my desktop machine is on a low equipment rack about four inches off the floor.) And this is without a hard drive installed. This noise probably won't bother you if the router is sitting in a family room or den. But if it's in a bedroom, it could be annoying. 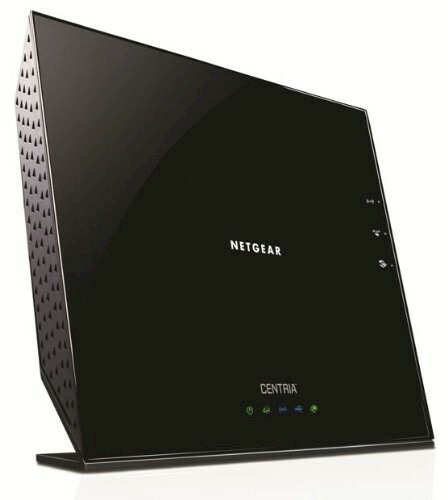 It's odd that the WNDR4700 is not Wi-Fi Certified, since it is not a draft 11AC router and NETGEAR usually certifies all of its wireless routers. The WNDR4700 was Wi-Fi Certified in March 2013. Table 1 summarizes the Centria's key wireless settings. Note that both Personal and Enterprise (RADIUS) forms of WPA/WPA2 security are supported and channel 165 is not supported on the 5 GHz radio. The main settings page shown below contains channel, mode and security settings. Wireless isolation (client-to-client access blocked) can also be enabled on each radio and there is an Enable Video Network option on the 5 GHz radio only. NETGEAR recommends checking this box if you are streaming HD video so that they can kick in "reliability algorithms to reduce jitter and packet loss during video presentations". I did not test this feature. Transmit power on both radios can be stepped down in 25% increments on the Advanced Setup > Wireless Settings screen. I've highlighted the Enable 20/40 MHz Coexistence control, which is enabled by default, on the Advanced settings page shown below. As noted below, the router properly implements both Coexistence and Fat Channel Intolerant behavior. But by unchecking this box, the Centria will ignore both rules and stay in 40 MHz mode in 2.4 GHz if you set the Mode to Up to 450 Mbps. The 802.11 spec and Wi-Fi Certification requires that both 20/40 MHz Coexistence and Fat Channel Intolerant mechanisms be implemented in 2.4 GHz. So if you uncheck this box, your router will be in violation of the spec. Continuing on with wireless features, there is one guest network that can be enabled on each radio. The creenshot below shows that each network has its own wireless security and isolation controls. By default, guest network clients get only internet access. But by checking the Allow guest to access My Local Network box, you allow full access to your LAN's wired and wireless clients.